The clinical efficacy and outcomes of gefitinib therapy as a first-line treatment for elderly patients with non-small-cell lung cancer (NSCLC) with epidermal growth factor receptor (EGFR) mutations were analyzed retrospectively. We analyzed chemotherapy-naïve NSCLC patients aged 75 years or older who had EGFR mutations (exon 19 deletion mutation or L858R), who were initially treated with gefitinib (250 mg) once daily in Nagano Prefecture. A total of 55 patients (16 men, 39 women) with a median age of 81.1 years (range; 75–94 years) treated between April 2007 and July 2012 were analyzed. The overall response rate and disease control rate were 72.7 % (95 % confidence interval (CI); 59.5–82.9 %) and 92.7 % (95 % CI; 82.0–97.6 %), respectively. 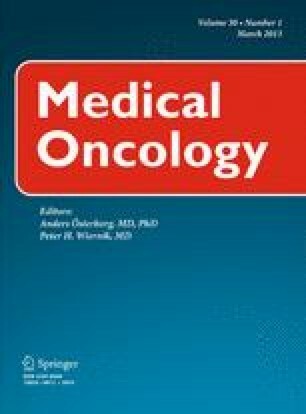 Median progression-free survival and overall survival from the start of gefitinib treatment were 13.8 months (95 % CI; 9.9–18.8 months) and 29.1 months (95 % CI; 22.4 months–not reached), respectively. Two-year survival rate was 59.5 % (95 % CI; 41.0–78.0 %). Major grade 3 toxicities were skin rash (1.8 %) and increased levels of aspartate aminotransferase or alanine aminotransferase (7.3 %). First-line treatment with gefitinib for elderly EGFR-mutated NSCLC patients was effective and well tolerated. The results suggest that first-line gefitinib should be considered as a preferable standard treatment in elderly patients with advanced NSCLC harboring EGFR mutations. We thank the patients and their families for their support and participation in this study. We also thank Akihiro Tsukadaira in Iida Municipal Hospital, Muneharu Hayasaka in Chushin Matsumoto Hospital, Akio Morokawa in Showa Inan Hospital, and all of the members of Nagano Lung Cancer Research Group for their helpful support. Title of subordinate document. In: Common terminology criteria for adverse events (CTCAE) Version 4.0. National Cancer Institute. http://ctep.cancer.gov/protocolDevelopment/electronic_applications/ctc.htm#ctc_40 of subordinate document (2012). Accessed 28 Nov 2012.